Usual running plates are almost too small for large rodents such as chinchillas or degus. To avoid bent backs or broken legs, Wagner's designed the large Running Plate made of metal. Silence, stability and fun are only a few of the great characteristics of Wagner's Running Plates. Whether you have a degu or a chinchilla, our Running Plate it's designed to fit perfectly to bigger rodents. The special designed profile gives a lot of safety to your animal while running on the plate. 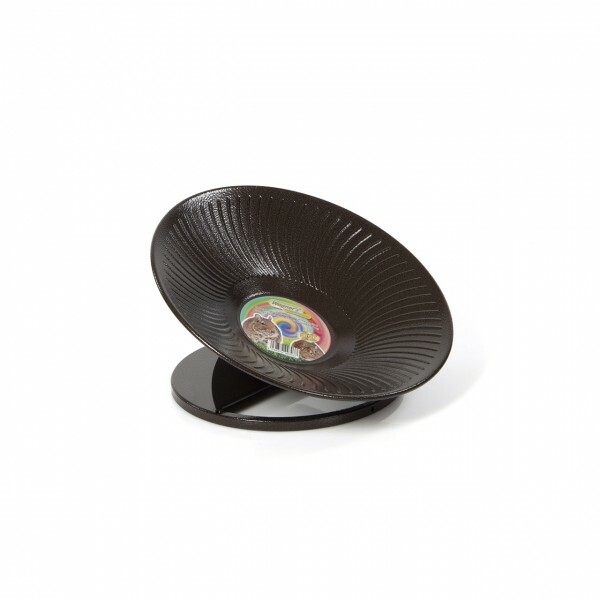 The strong material and the famous Avilon powder coating make this Running Plate a perfect toy for your animal. Even if your pet tries to nibbles off the Running Plate, we assure you that nothing will happen - the renowned Avilon powder coating is nontoxic. Our Running Plates are available in the trend color brown. ball-bearing suspension made of steel. The running plate should not directly be placed in or covered by the bedding. Otherwise fines and dust can acquire into the ball-bearing suspension. Regular cleaning and lubricating ensures the running smoothness and thus a long life. links "Running Plate Large made of steel"
customer reviews on "Running Plate Large made of steel"